What would your life be like if you had a sense of space and peace wherever you are? What would be possible if you didn’t have to feel contracted, compressed or at the effect of the world around you anymore? What would your life be like if you had a sense of space and peace...wherever you are? The Energetic Synthesis of Communion (ESC) with Dr. Dain Heer is an undefined exploration of the energies, spaces and possibilities that exist beyond the order of this reality. It’s an invitation to the communion that is actually possible every moment of every day ... a doorway to the thrum of the earth and the gift that it can be to you and your body. 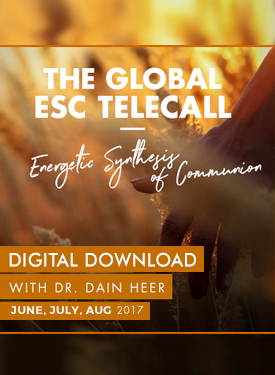 Join Dr. Dain Heer for this 3-part ESC telecall series where he facilitated ESC’s on the phone with people worldwide, 3 days in a row. No matter where you are in the world, you can lay down and receive the gift that the ESC energy is. It's beyond words, it's through everyone and everything, every molecule in creation, thrumming and vibrating and contributing to healing of you, your body and the planet. Is now the time to allow the magic of this energy to contribute to you?